PQ and OQLF? STFU and GTFO! 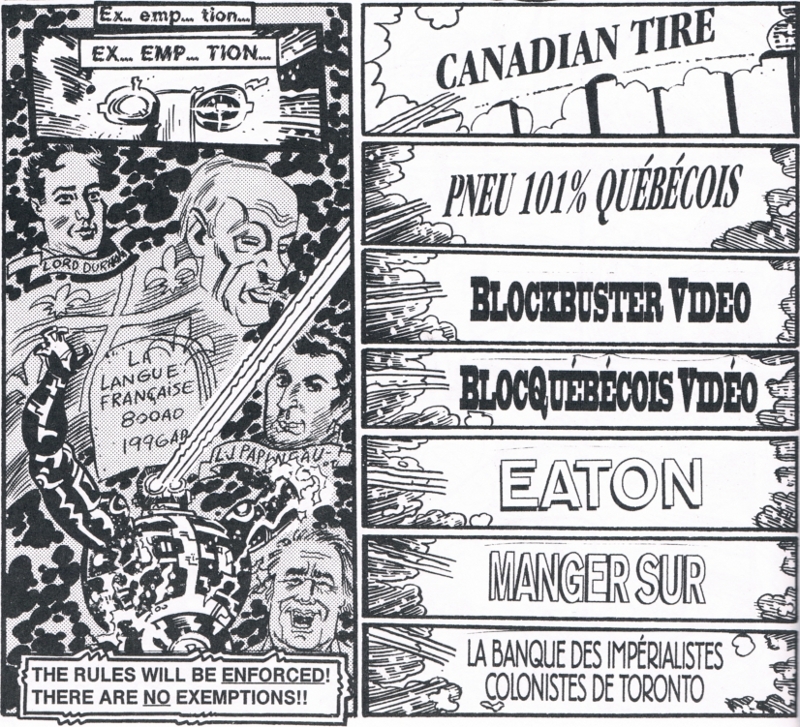 Today’s the day of the 2012 Quebec General Election, and I’m hoping that any Quebecers reading this will do their best to keep Pauline Marois – the sum of whose political ambitions entirely fall into the categories of “separate Quebec from Canada” and “discriminate against English speakers by reinforcing the already draconian language laws or creating new ones” – out of office. Remember: A vote for the Parti Québécois is a vote for the giant, scary, malfunctioning robot from the Quebec Board of the French Language, who will use his evil powers to translate every English sign he sees into French. Sadly, this isn’t too far from the truth. 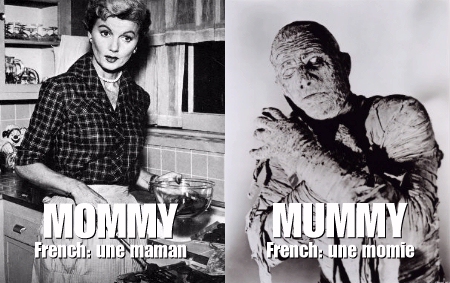 La langue française: The French language. Pneu 101% québécois: 101% Québécois Tire. Canadian Tire is the name of a Canadian retail store chain. BlocQuébécois Vidéo: Quebec Bloc Video. The Bloc Québécois is the name of a Canadian federal political party. Manger sur: “(To) eat on (top of)”. Eaton was the name of a now-defunct Canadian department store chain. La banque des impérialistes colonistes de Toronto: The Bank of the Imperial Colonists of Toronto, a riff on the Toronto-Dominion Bank, the second largest bank in Canada. This dark vision of things that may come to pass courtesy of Angloman 2: Money, Ethnics, Superheroes (November 1996) by Gabriel Morrissette and Mark Shainblum. I'm digging the Heavy Metal Umlaut in "Red Sküll". 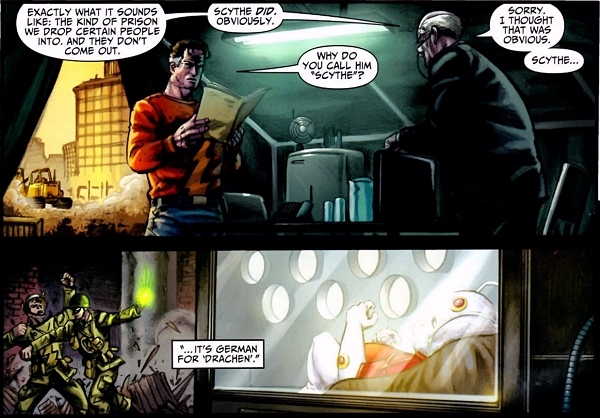 Maybe it’s because I’m so used to dealing with DC Comics’ atrocious translators, but I was taken aback by how astonishingly good the German was in this case. So, for those who’re curious about what it says, wonder no more! German: 25. Ausgabe / 52. Jahrgang / Einzelpreis: 20 Pf. A “Pfennig” was a German unit of currency (and, as the word’s spelling suggests, is etymologically related to the English word “penny”). 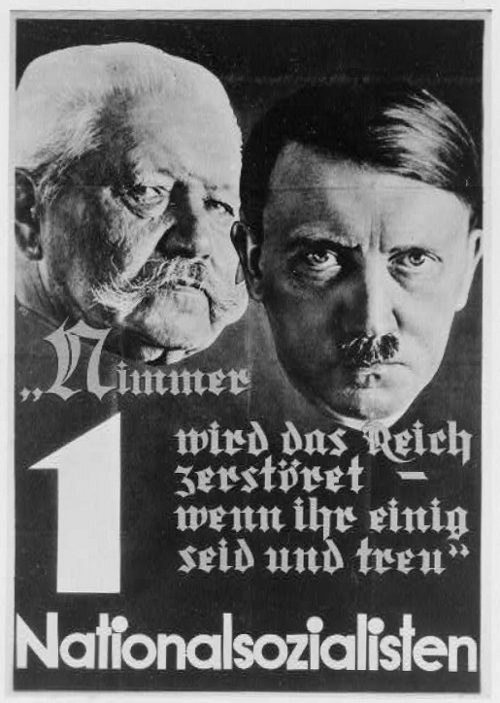 While the name of the miniseries appears at the top (of course), since this phrase was the motto of the Völkischer Beobachter (“Nationalistic Observer”), the official newspaper of the NSDAP or Nationalsozialistische Deutsche Arbeitspartei (“National Socialist German Workers’ Party” or Nazi Party for short) from 1920 to 1945, the cover is obviously intended to be a mockup of the publication’s front page. 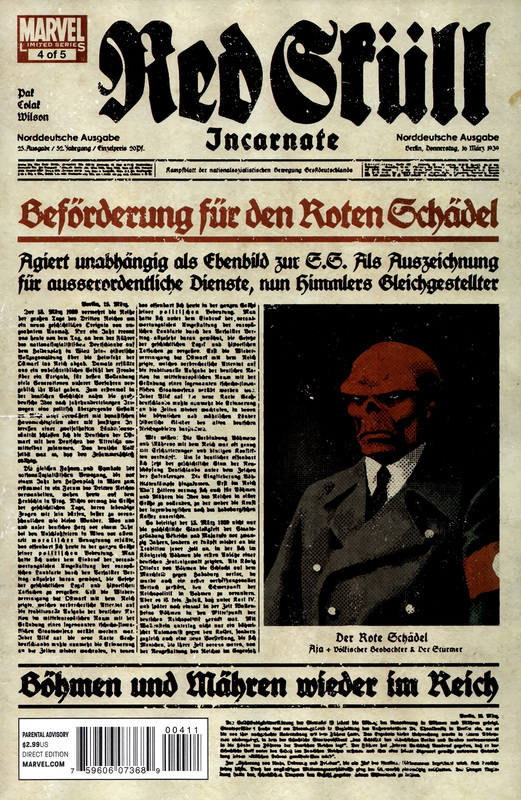 German: Agiert unabhängig als Ebenbild der S.S.
English: Operates as an independent counterpart of the S.S.
Can you imagine the level in badass the Red Skull must’ve taken in order to be declared an autonomous agent of the Nazi Party on par with the Schutzstaffel or S.S. (“Protection Squadron”), a frickin’ paramilitary force? “Himmler” is, of course, Heinrich Himmler, the Reichsführer-SS (“Reich Leader of the SS”). 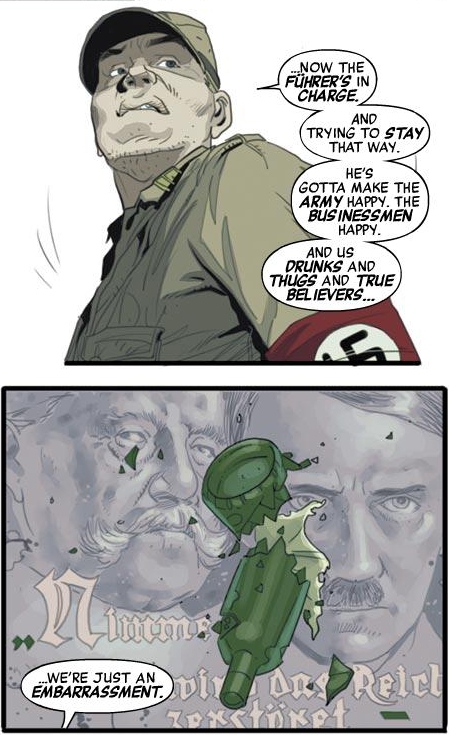 This means that, at this point in time, both he and the Red Skull reported directly to Adolf Hitler himself and were one step away from being king of the mountain. There’s a slight spelling mistake here, though, as the “ss” in “ausserordentliche” should actually be a “ß” (sharp s). The cover artist, David Aja, manages to slip a small self-reference in in the form of a picture credit. Also, Der Stürmer (“The Stormer”/”The Attacker”) was the name of a weekly Nazi Party tabloid published between 1923 and 1945. 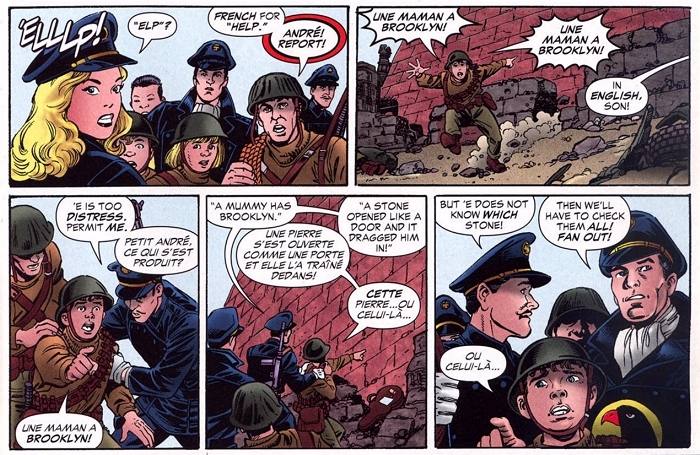 This is a reference to the Protectorate of Bohemia and Moravia, which was established by Hitler on March 15, 1939, one day before this issue of the newspaper was released on Earth-616. Notice how the headline about the Protectorate of Bohemia and Moravia in the authentic version matches that of the fake word for word. Someone really did their homework on this one! The mockup isn’t quite perfect, though. 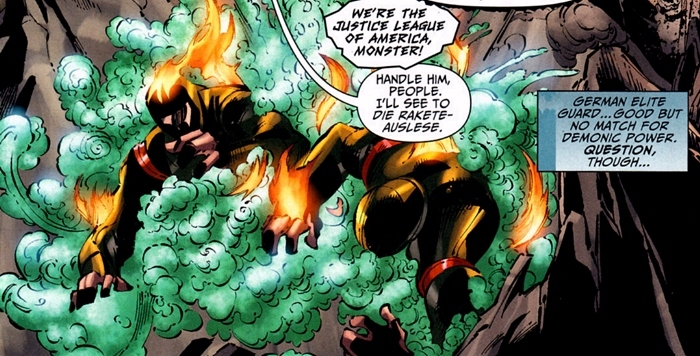 Aside from the aforementioned spelling mistake, while the font used for the cover of Red Skull: Incarnate #4 is damn close to the original one, it uses a modern “s” instead of the archaic “ſ” (the so-called long, medial, or descending s). Also, the contemporary German spelling of “nationalsozialistischen” appears in the motto instead of the period accurate, hyphenated one (“national-sozialistischen”). But those’re extremely trivial details, all things considered. A tip of the hat to David Aja, Alejandro Arbona, and Sebastian Girner for putting that much effort into a miniseries front cover! Considering how earth-shattering an event the attack of giant stone creatures summoned by Magical Neo-Luddites is, the 18th century Germans sure picked a boring name for it for posterity: “Ungeheuerangriff” translates as the somewhat mundane “Monster Attack”. Perhaps they simply lacked imagination…or anything remotely similar to compare it to. On a side note, since “Angriff” is masculine, it should actually be “Der Ungeheuerangriff” and not “Das Ungeheuerangriff”. 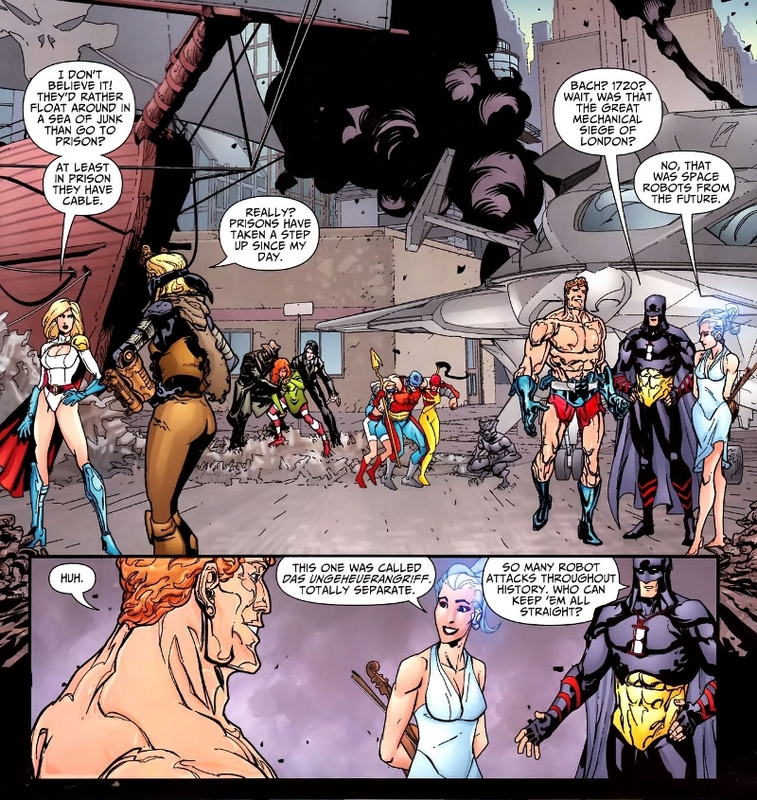 As you can probably guess by the unimaginative title of the premiere entry in this ongoing series, I’ll be using these blog posts to provide English translations for foreign language text appearing in comic books, cartoons, movies, television shows, anime, manga, and whatever else strikes my fancy. German: Wie lange haben wir erreichen das Ziel? English: How long do we have reach the target? Yes, that’s a literal translation, meaning that the original is grammatically incorrect. “Wie lange, bis wir das Ziel erreichen?” (“How long until we reach the target?”) would’ve been more accurate. German: Dreissig Sekunden, Commander Danitz. English: Thirty seconds, Commander Danitz. To be fair, though, translating “commander” isn’t as clear cut as I’ve made it out to be here: it’s highly dependent on the branch of the armed forces you’re dealing with as well as the country. If you were to subtitle or dub a movie or television show that focuses exclusively on the U.S. Army, for example, you’d usually leave the rank designations untranslated. Commander Danitz is obviously German, though, so I see no reason for them to leave it in English here. This is a common mistake. 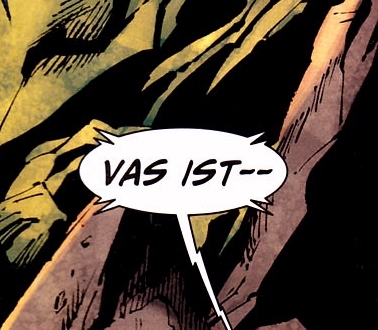 “Was” (German for “what”) is written with a “w”, not a “v”. The reason why this error appears so frequently is due to pronunciation differences between languages: the German “w” sounds more like the English “v”, while the German “v” sounds more like the English “f”. The poor guy didn’t even get to finish saying “Nein”. The grammatically correct translation would be “Die Raketen-Auslese”, though I would’ve gone with “Die Raketen-Elite” myself.